I'm continuing to read 'A fortunate man' which describes the life of an English country GP in the 1960s. I've been aware of the book since training as a GP nearly 40 years ago, but have never sat down to read it. 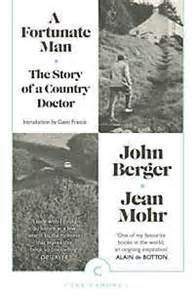 In retrospect I think that if I am honest the traditional, all consuming practice of medicine which is described in the book, and which I was faintly aware of, was what inspired me in a rather simplistic but genuine way when I first remember wishing to become a doctor at the age of 15 years. The GP Gavin Francis, who is also a published author (his fascinating book Adventures in human being is well worth a read) , writes in the forward, that the book describes, 'a celebration of a way of medicine that we have all but lost'. I'm very aware of that as I come to my last few days as a partner in general practice. So many of the memories that patients have shared recently with me have been of experiences which current GPs seldom if ever know. And so a lady told me that 25 years ago when I was visiting her after the birth of her twins, I apparently welcomed the twins into the world and said to them that I hoped that in some small way they would make the world a better place. We no longer have the time (nor inclination`) to visit postnatally. And yet the mother still recall my words! And then the old lady reminiscing with me of the time when I attended her husband in the middle of the night after he had died and stayed with her to drink a cup of tea and just sit and be with her for an hour. Now the patient's own GP virtually never visits at night. And then the former neighbour who recalled that she asked me to have a look at her breathless baby one cold winter's evening, and tells me that I packed both her and the baby in my car and drove straight to the hospital. Now sadly we would be worried about insurance and liability, we would probably call an ambulance (and what anxiously for it too arrive whilst the baby deteriorated). Gosh how things have change. Alas GP is less fun, less passionate, less personal and more beurocratic. No wonder the number of medical students wanting to be GPs is down. If only they could hear just a few of these sweet nostalgic stories my patients are generously recounting to me in my final days, they would realise just what a fortunate man I am and how still, if they are willing to buck, the trend it could yet be for them.